We've recently released new cat stationary; this stationary draws from the styles of fashion and miscellaneous goods magazines. 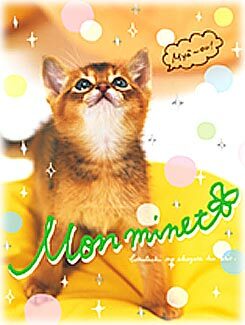 These ”Monminet,” photos of cute cats with popular sweets, can be enjoyed by a large target group with no problem at all! Dani is back and has kindly translated this kitty character! 1. "Mon minet" is a phrase in French that translates to "my kitty" or "my pussycat."